We were absolutely thrilled last week when Pink Confetti received the Guides for Brides 5* Customer Service Award for the whole of the Midlands region!! When we opened (almost 5 years ago now!) one of our first goals was to offer an exceptional level of service to our customers. As this award is based on votes and feedback from our brides it looks as though this is now something we can say we’re achieving. 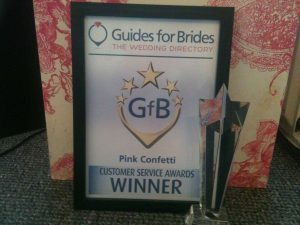 Guides for Brides is one of the largest and well established Wedding Directories and we were up against competition from all wedding business sectors across the Midlands so were delighted when we were shortlisted as one of the 34 national finalists – needless to say we were ecstatic when we were notified we had won – one of only 10 National Winners! As a small, village boutique when we are entered into any of these awards, against some of the great names and brands across the wedding industry, winning almost seems an impossible dream. The wonderful thing about this award is that although we didn’t receive the highest number of votes the decision was based on the detail in the feedback they received – so our sincere thanks to everyone who voted for us and said such nice things!! We’d like to say – You are very welcome!